Last Tuesday evening, two flute players and two oboists stood on the outdoor terrace of Hotel Vermont in Burlington. Ignoring the drone of HVAC systems, they played Cuban-themed pieces for a half hour. An audience of 17 sipped drinks, checked phones or chatted, but still applauded appreciatively after each brief piece. It was, after all, a beautiful night, and the musicians were young, personable and obviously talented. In introductions, they revealed that they had all earned, or were currently working toward, master's degrees in music at either Yale or Rice universities — two of the country's top conservatories. They had arrived in Vermont only the night before, and this was their first performance in the Vermont Mozart Festival. 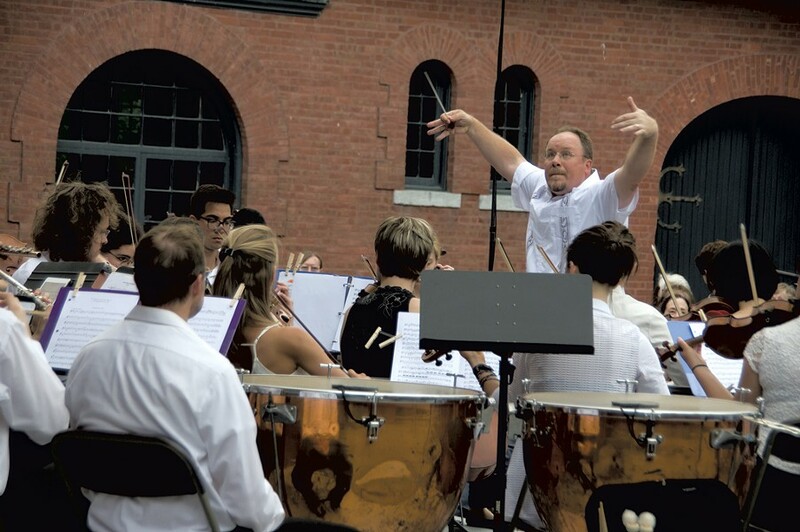 The latter is not the VMF of old — the annual statewide summer series involving invited professionals and ensembles, including the Vermont Symphony Orchestra. That festival, founded by oboist and musicians' agent Mel Kaplan, ran for 36 years until financial pressures ended it in 2010. The new VMF, conceived by violinist Michael Dabroski and now in its second year, is based on a different model. Its 35 musicians, called fellows, are new or nearly minted professionals from around the U.S., Canada and Cuba who are young enough to be willing to perform for free. This summer, they are playing 18 concerts, mostly at Chittenden County venues — six concerts as a small orchestra and the others in various chamber combinations. In return, they receive three weeks of housing and meals at Champlain College and guidance in career-development projects they have conceived. The new VMF aims to reach a truly general audience. Its orchestral concerts capitalize on some of the same popular venues as the old festival, including Shelburne Farms and the Trapp Family Lodge Concert Meadow. But it has acquired a few more: Charlotte Town Beach, Veterans Memorial Park in South Burlington, ArtsRiot in Burlington and the Burlington Country Club. Kevin O'Leary, a former neighbor of Dabroski's who is donating his services as the festival's marketing manager, noted that the concerts are meant to be enjoyed without any knowledge of the music. Recalling last year's Veterans Memorial Park concerts, he enthused, "I don't know what they're playing, but I'm outside, the sun is setting, I can see the lake, and I'm drinking a beer." O'Leary has worked in the indie-rock music world and is currently the business development manager at Select Design. He designed a red trucker cap for the festival — it reads "Make Mozart Great Again" — as well as T-shirts, golf caps and stickers. Apart from volunteers like O'Leary and Michelle Nguyen — one of the oboist fellows in charge of the whole group — the VMF is a one-man show. Musician-businessman Dabroski has rounded up funding, primarily from NBT Bank; sought out the musicians; arranged the accommodations, busing to venues and other logistics; and secured concert sites. "I really admire what Michael is doing, and he's doing it all himself," said Nguyen, 24, who joined a reporter for lunch at Champlain College's dining hall on the day of the Hotel Vermont concert. 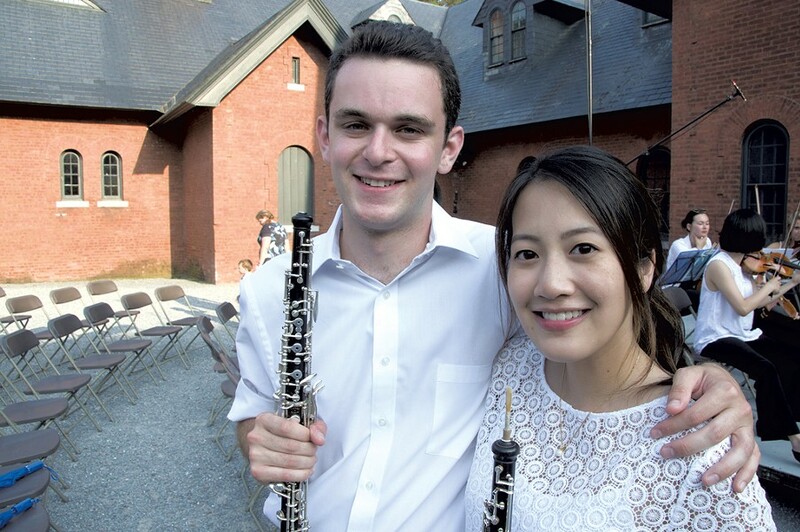 Her colleague and fellow graduate of Yale's master's program, clarinetist Sam Boutris, also attended. Nguyen is pursuing a second master's at Yale in musical arts with the aim of becoming a music administrator. Boutris, 26, landed a position in the Juilliard School's artist diploma program, which provides management and career development for two years. Nguyen and Boutris, who are among three returning fellows, explained why they are thrilled to participate in the VMF. As musicians, they've attained a skill level beyond that of participants in summertime educational festivals such as the Green Mountain Chamber Music Festival. The latter houses nearly 200 students and visiting faculty for three weeks at the University of Vermont, charging tuition in return for intensive instruction. They also see the aim of the VMF as different from that of the Lake Champlain Chamber Music Festival, which Boutris described as presenting high-quality professional concerts to classical-music aficionados. A big draw of the VMF for him, he added, was Vermont itself — an opinion echoed by other participants. Oboist Noah Kay, 23, is taking time off from a master's program at Yale to fill a chair he just secured in the Colorado Springs Philharmonic. "I couldn't pass this up. I love Vermont," he commented after the Hotel Vermont concert. Kay said he received an invitation from Dabroski to apply, which involved sending in a CV and a performance video. This is Kay's 14th summer in Vermont. A self-described "Yellow Barn brat," he has spent the past 13 summers living at the Putney music festival of that name, where his clarinetist father is on the faculty. He applied as a student this year but didn't get in. Composer and bassoonist Scott Switzer, the third festival returnee, recalled that his goal last year was to "meet young colleagues, play high-quality music and enjoy the beautiful scenery of northern Vermont." This year, Dabroski commissioned Switzer, 31, to write a piece that "celebrated the work of Mozart." Switzer's composition, titled "Adagio/Andante," will premiere at the August 4 concert at Trapp. Switzer, who earned degrees from the Eastman School of Music and Yale, teaches in the Connecticut community college system and at the University of Hartford's Hartt School Community Division. At last year's festival, he noted, experimental stagings of free performances at the Charlotte Town Beach eventually drew more than 100 people, making the venue a lock-in this year. "I believe Michael is really trying to be creative in the performance spaces, to find different audiences," Switzer said. Dabroski has spearheaded several community-oriented initiatives with local musicians since he arrived in Vermont in 2005, with varying degrees of success. These include Burlington Ensemble, a concert series in collaboration with (and benefitting) nonprofits, which lasted more than three years; a planned artists-in-residence program at Castleton University that didn't get past the press-release stage; and a music school at Burlington College that never got off the ground because the college closed. After the Hotel Vermont concert, a bevy of other fellows presented an all-Mozart concert at ArtsRiot. Boutris and two colleagues, on bassoon and clarinet, performed a series of Mozart arias, which the composer himself scored for trio. They were followed by a string quartet and clarinetist, who played Mozart's only completed work for that combination of instruments. Clarinet Quintet in A, K. 581, is not an easy piece. The musicians had had time for only one rehearsal the night before, and it showed in these otherwise highly trained players' lack of precision and unified phrasing. One wished for the polished performances of the Marlboro Music Festival, whose participants have all the rehearsal time they need — sometimes weeks — for each piece. But the VMF performance, delivered to a smattering of folks, no doubt reached some who had come solely because they enjoy the hip venue. And that was exactly the point. The original print version of this article was headlined "Music Mozart Fest Brings Emerging Performers to Unconventional Venues"